Last week, I was in the store with Leao and the boys and I came across this kettle. I immediately was drawn to the color and design. I walked over and picked it up and Leao came over and said, “Let me buy it for you.” I immediately said no. So off we went. A few days later I kept thinking about it but didn’t go back. Well yesterday, after a long day of orthodontist appointments and book club meetings, the boys and I came home to find Leao home from work. We began putting our stuff away and gettting settled in and as I walked through the kitchen, I saw this beauty on my stovetop. I was so thrilled. I immediately picked it up and discovered something I didn’t before, the words on the spout, “Whistle While you work”. (think Snow White and the Dwarfs) Oh my goodness that is so cute. Leao knows I love all things tea and I expecially love whistling tea kettles. It is so stinkin’ cute I can’t stop looking at it. It even comes with it’s own oven mit (see top left photo) to prevent burns when handling it. I keep putting the mitt on the counter nex to the stove when I make tea so I won’t forget. I love it so much and I love that he knew it was still on my mind and got it for me. Love that guy. Happy tea time my friends! So cute! 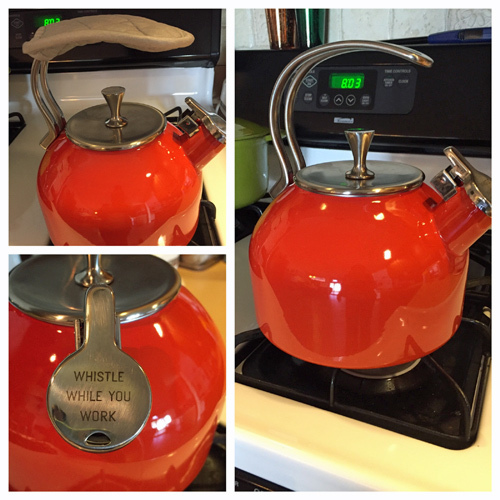 And yup, love my whistling kettle! Every kitchen needs one! Hi Ashley! I had one a long time ago and bought an electric kettle last year but I always missed my whistling kettle. There’s just something special about it. Great color! What a nice surprise. Everyone should have a tea kettle on their stovetop. Hm…I may have to pick one up. I love the color too. In the summer I always lean towards burnt orange colors on the deck decor. It has a warmth too it that really makes me happy.